Is this localhost entry good or rather you need to ip the server enter either the domain. 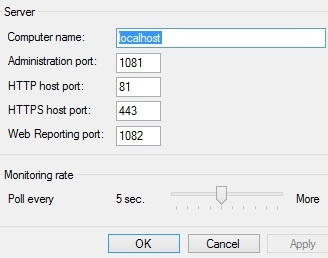 After installing the client on the host I have a small problem because it installs it on the old port and the IP of the one he just asked about and does not transmit to communication those that are in the server settings. What is proved by the prompt, the update was unsuccessful. Because you can see this old port 80. 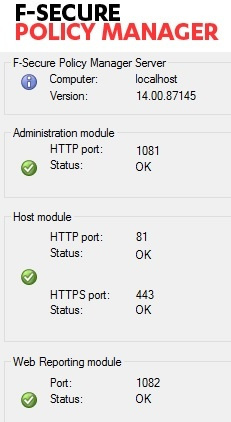 When you enter custom address 192.168.1.3 and port 81 in the Connection tab, when the update works. So please tell me how to install it so that you don't have to enter it by hand. Thank you in advance and ask for an answer. Please, note, that the PM address/ports you specify in Remote installation wizard "Configure configuration with Policy Manager Server" page should fully correspond to the address of your server. Also, make sure, that in PM Console > Settings (Standard view) > Central management you have Policy Manager Server host configuration settings are configured properly. Preferably, set the final flag for them. If you still have issues, please, contact support. We will need diagnostic information from your PM and affected client machine for investigation.